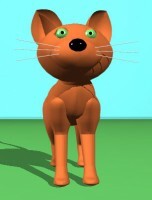 Wire-frame model of the cat. 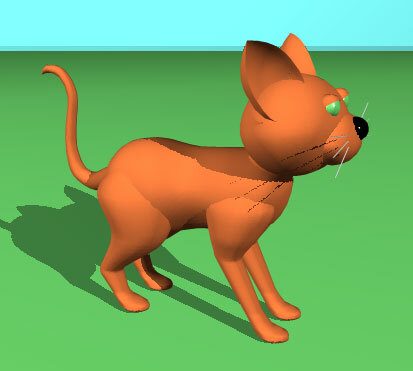 A computer generated cat has emerged from my experiments with the Animation:Master program that I mentioned in my Computer animation revisited post. I started with the head by creating a ball shape. A smaller ball was created for the snout and half pushed into the head. A ball was added for the nose and two balls for the eyes. Eyelids were modelled from half balls and positioned on top of the eyes. The ears are also created from half balls. The whiskers are long thin tubes that resemble drinking straws. Final render of the cat. The body started as a fat sausage shape that I pulled around until I was happy with it. The tail started as a long tapered sausage that was moved around to get the curve. The legs also started as long sausage shape that I gradually moulded until I got them to what they are now. An Internet search found me a diagram of a cat skeleton that I used as a guide to as to where the legs would bend. Colour is added by selecting an area on the model and giving it a name. Once named it can have various attributes associated with it such as a chosen colour. The nose and eyes have been given a shiny surface as you can see from the highlights. We love your blog and think you are right to raise this important issue. We have been thinking along similar lines here in BS. It is good to connect with other like minded thinkers on these issues. Keep up the good work and keep the debate going. Thank you for your input ADA sport. I am surprised that you think my computer modeled cat is an important issue. I did have a lot of fun creating it so I guess it is an important issue to enjoy ones self.